What on earth does this super addicting game have to do with anything eye related? Well, in order to “catch ‘em all,” you have to physically move around to find the Pokémon. If you haven’t witnessed people playing this game, keep looking. You’ll see them. Trainers will be walking around staring at their phones, randomly stop (churches, parks, and other random landmarks seem to be popular spots), do a few movements with their phone, and then keep walking with either a look of delight or sadness on their face (the sad ones let the Pokémon get away). You’ll frequently see them searching for Pokémon in groups with their friends. Just watch and make sure they don’t step out into traffic in front of you! All that being said, if you start playing the game, you’ll be paying even more attention to your phone than you did before. This creates strain on your eyes, often called Computer Vision Syndrome or Digital Eye Strain. People who are far-sighted (those who see better far away than up close) or those who are presbyopic (the focusing system is no longer as strong as it needs to be, thus requiring a bifocal of some sort) will often have the most complaints related to Digital Eye Strain, especially when not wearing glasses. Digital Eye Strain is diagnosed through an eye exam. This includes talking with the individual about what roles technology plays in both his or her occupation and lifestyle. It also includes a detailed look at the health of the eyes and a careful refraction (the “which is better, 1 or 2?” part of the exam—if this stresses you out, check out my previous blog post on this topic), and extra assessments of how well the eyes move and work together. A great analogy I learned in optometry school is if I give you a couple bags of groceries and ask you to carry them around without putting them down at all. It isn’t tough at first, but the longer you have to carry them, the heavier they seem. But, if you can have periodic breaks from carrying the weight, you can probably pick them back up and keep on carrying them. The focusing system (called accommodation) is stimulated when we look up close. Our eyes turn in and the focusing mechanism kicks on. If we don’t look up and away, our eyes don’t get a break. Digital Eye Strain is relatively treatable. The easiest thing to do is called the 20-20-20 rule. Basically, every 20 minutes you need to take a 20 second break from looking at your device or computer at something that is at least 20 feet away. Set a timer if you have to. Get up and get a drink. 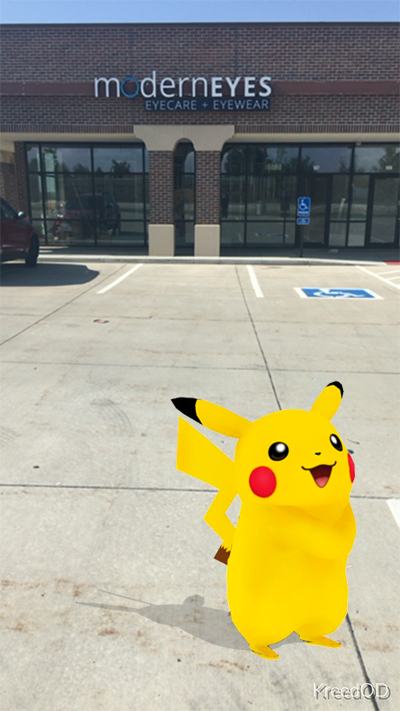 Look out a window at the Pokémon Trainers trying to “catch ‘em all” at a Pokéstop or Poke Gym near you. Another option is a pair of glasses with a prescription for anti-fatigue lenses. These lenses have an area toward the bottom of the lens that offsets some of the work the eyes must do in order to focus on near objects. They often have a special coating on the lenses that also blocks blue light, another hot topic in the world of optometry (I’ll likely address blue light exposure in a future blog). When ModernEyes Eyecare + Eyewear is open and ready for business, be sure to ask us about glasses that will meet your technology needs. Dr. Reed and the other staff members will get you seeing clearly in no time! 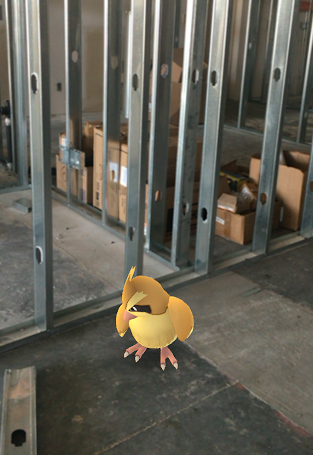 Or, you can come check out the friendly Pokémon that live in the office, too. Be sure to check out and like/follow us on our social media pages to stay up to date on our progress!